Holly, thanks for having me here today and for the chance to share my relationship with my characters. Every time I write a book, I develop a very close relationship with my characters. 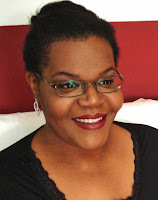 To be able to write their stories, I have to understand their motives, likings, and weak points. I'm often asked which of my characters I like most or least, the answer is not simple. Even a negative trait can become endearing. Best example is Dexter Morgan from the TV show and the main character in Jeff Lindsay's series of novels. Liking a negative character shouldn't reflect badly on you as a reader or author, but it shows how well rounded that character is. There should be evil and good in all, including fictional characters. Hellbound has 3 short stories; The Deadening, The Substitute, and Scorned. I will share my feelings towards each main character while attempting to keep the stories shrouded in mystery. In The Deadening, Bart is a morgue assistant in charge of dead bodies brought into the morgue. He's an average looking opportunist who has only one friend—if you'll call Moe that—and is very self assured. Writing him was like writing about that silent bully from school days, the one that doesn't push or insult, but only studies you as though you're an inferior species. His strength stems from your uncertainty of the extent of his power. I didn't like Bart initially, but after he received the Pain Letter—and definitely by the end—I pitied him. On the other Stan from The Substitute is so handsome—and aware of it—that one of his customers wonders why he didn't consider modeling as a career. Surely agents would fight over the chance to represent him. Stan, however, is a practical man, one who knows looks wither while money remains. So he becomes a medium, a job that is part charm, part skill, part real spiritualism, even though he didn't have a single spiritual bone in his body. I never pitied Stan. I think he deserved what he got at the end. We've all known or heard of someone like Jenna from Scorned. A housewife so dedicated to the satisfaction of her husband that she takes care of the house and learns how to do everything—and in the process, neglects herself. Her devotion to her husband erases her personality and what makes her unique. And then he goes and scorns her? Very. Big. Mistake! I liked Jenna. She displayed both sides of a woman; her softness toward the one she believed to be her soul mate and her subsequent hardness to set things right. Too right in my opinion, but hey, you don't want to cross Jenna. When she took over the story at the end, I could only type, no thinking, no plotting, just sweet Jenna whispering her wishes in my ear. Yes, I do develop a relationship with my characters, I like some more than the others, but they are all real to me. Horror isn't always blood and gore; true horror is what's inside people, the real stuff, not the fluff shown to others. Hellbound has some blood and gore (even some yuck moments) but it is real to me…because people can't hide what they truly are when they're hell-bound. On the paths leading to the depths of Hell, their sins don’t matter!" A scraping sound came from behind the small bar in the corner of the office; Stan swiveled his head in that direction. From the corner of his eye, he caught Jo’s mocking smile. The begging quality of her voice squeezed the life out of his heart. His proud, confident aunt was reduced to this creature? He backed away. “This is a trick. You’re playing with my mind.” He whirled around and faced Jo, who’d shifted around until she could peer down on the old woman as well. Wetting his lips, Stan gazed down at the woman who’d raised him like her own son. He couldn’t do this to her. Of their own accord, his hands stretched to touch her, to ease her pain and worry. All of a sudden, she vanished. Just like that; one moment she was there, and the next he was staring at the small rectangular carpet. “Do you believe me now?” Jo asked in a calm tone. Holly, I love your blog, dark and inviting at the same time. Thanks for the chance to share my relationship with my characters, I hope you and your readers enjoy reading it as much as I did writing it. Love the excerpt, Su, and I'm busily collecting points so I can have the book! Hi Jenny, Nice to see you here. I'm real glad you're following the tour. Good luck, darling. Wow, this book looks really good! The excerpt was really good! 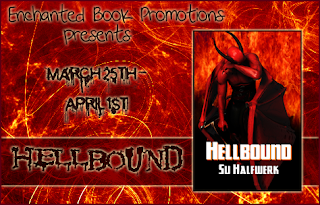 Your recent release "Hellbound" sounds like a Darkly Intriguing Read, one not to be missed. Your Cover Art just draws a Reader right in to want to know More! I filled out the Rafflecopter, but I'm not a Member of Facebook or Twitter, so I did what I could.